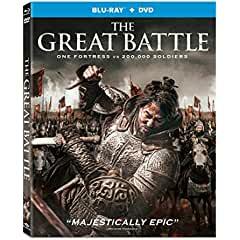 Director Kim Kwang-Sik (My Dear Desperado) brings to life the first Korean action blockbuster to depict the Goguryeo dynasty in the epic story THE GREAT BATTLE, ready for combat on digital, Blu-ray™ Combo Pack and DVD January 8 from Well Go USA Entertainment. Set during the Tang dynasty, the action-packed film is based on the historic 80-day battle between the Goguryeo and Tang forces known as The Siege of Ansi, that took place while the two groups were at war between 645-668 AD. Kwang-Sik uses cutting-edge cinematic technologies to create spectacular action sequences in THE GREAT BATTLE which stars Zo In-Sung (The King), Nam Joo-Hyuk (“Bride of the Water God”) and Park Sung-Woong (The Swindlers). The discs also come with a behind-the-scenes featurette with commentary from the director and cast. THE GREAT BATTLE has a runtime of approximately 136 minutes and is not rated. Follow @WellGoUSA on Facebook and Twitter and use #TheGreatBattle.